I am a mom to four daughters, ages 12 to 19. Yet for the past 10 years I’ve also become the caregiver to my own mother, who broke her neck in 2006, almost died, had to re-learn how to walk again, and ultimately made a miraculous recovery. 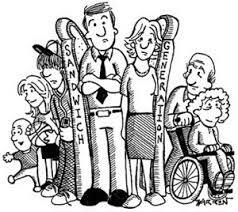 It was at this point that I became what sociology calls part of the “Sandwich Generation” – a generation of people, typically in their thirties or forties, responsible for bringing up their own children and for the care of their aging parents. 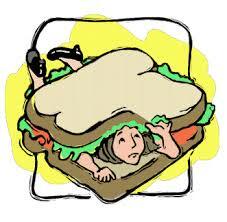 I wasn’t forced immediately and hastily into the “sandwich” role, like a slapped together peanut butter and jam sandwich; my role was more like a slow cooked beef on a bun. And I gradually bit into it. After my mom broke her neck, and while in the hospital for an entire year, I had my strong and reliable dad to help her. So while I made the daily trek to her hospital bed for over 11 months, (with 4 small children in tow), I had my Dad managing most things. He was the rock. But even rocks get chipped away with age. During my mom’s time in the hospital rehabilitation unit – ironically while she was re-learning to walk again – my dad picked up a strong and very resistant bacterial infection and had his leg amputated. Wham. Now I had two parents who suddenly were immobile and both in hospital, but two different hospitals, 40 minutes apart. Instantly I found myself thrust firmly into the sticky sandwich role, but I did so lovingly and wouldn’t have it any other way. After near death, a broken neck and limb amputation within one year, I realized that life hangs like a thread on a spider’s web. A mere wind can change the make up of that web in an instant. For four years I cared for my two parents, all the while juggling four young children. Sadly my dad was diagnosed with cancer and passed away in 2010. From that year on, I became the main care-giver for my mother, who relies almost exclusively on me for help. Oh and she lives at home. A three-story home. With lots of trees and bushes. And two hedges. A home she refuses to leave and will not consider any type of a senior facility. In fact she gets mad at anyone who mentions the topic of senior homes. We call it the “s” word. She also refuses to hire help, such as lawn care, a cleaning service or snow removal. Ergo my brothers and I do it. I am now firmly embedded in a PB & J sandwich, stuck at times to a fresh slice of love and a stale, moldy one of resentment. This sandwich – well frankly it’s not great. This is a job I did not plan for, nor do I particularly enjoy it, and my matriarch-boss can be, well, a tad demanding of my time and less than appreciative most days. It all makes for a very difficult juggle. And resentment, if I’m honest, does creep in. I cannot go back to a career full time: between my own family and my mother, there realistically is no time. I cannot plan any vacations for my family at Easter or Thanksgiving or Christmas, because my mother expects me to plan a lovely day, for her. She is, in fact, more demanding than any of my four daughters ever have been. Even when they were two years old. This leads to another wave of resentment at times, because my mother takes so much of my time away from my own kids and my own life. What has my life become? Not the one it used to be that’s for sure. And because of this I feel a tinge of bitterness for being given the head role of care-giver for our mother. It seems that as the only surviving daughter, it has always been “my job” to care for mom. And she’s not an easy patient. As a family we enjoy our life tremendously. For that reason I do not like to complain. And here I am doing it! It’s that darn moldy bread that sometimes leaves a bad taste in my mouth. Work part-time from home, take one child to the orthodontist, take one daughter for an annual physical, follow up with my own doctor about a recent test, prepare my other child to leave for Arizona where she’ll be competing in a swim meet for a week, but before she leaves, take her shopping to buy her a grade nine grad dress, get myself organized for my other daughter’s grade 12 graduation, throw a birthday get together for my 15 year old, and in my spare time tend to the cooking, cleaning and laundry. The idea of exercise to try to remain healthy occurs to me at 11:30 pm, after my 10 minutes of TV – the news. Oh, and my mom needs the following this week, as indicated by her call today: 5 books from the library (and STAT says she); her groceries, some bedding out plants (and then plant them), unplug her toilet, trim one of her backyard trees, buy her some underwear, oh and did she forget to tell me that she also has two doctor’s appointments this week? Yes, she did forget. So now I’m scrambling to fit this all in to my carefully planned schedule, all the while trying to work. This, at times, triggers the bitterness I speak of. Ahhh…It’s quite a little pickle. Perhaps it’s easier when one has a parent that isn’t demanding, but in my case, my mother has always been, even before the broken neck. 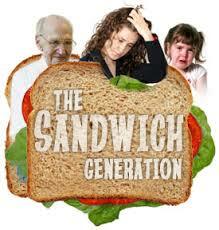 This is the life of the “Sandwich Generation”. We have been placed in the role of mother to our own young children and caregivers to our aging parents. And I must say that there are times when bitterness creeps in, along with some resentment – the stale, moldy bread rearing its ugly flavor. It’s at this point that I go for a run, at 11:30 at night (my down time). Or I put some distance between my mother and I. I may even take up yoga, should I find a class that runs at midnight. Ohmmmmm…. Sarah Hourihan has four daughters, aged 12 to 19, with her husband Graham. She juggles her time between her children, their numerous sport and school activities, her husband, a career, one cute dog and whatever else comes her way. A native Albertan born on the prairies, Sarah lives in Calgary and enjoys her summers in the sunny Okanagan, boating, swimming and basking in the beauty of British Columbia.